CBEMA Curve is one of the most frequently employed power acceptability curve. It was developed by the Computer Business Equipment Manufacturers Association in the 1970s, as a guideline for the organization's members in designing their power supplies. Basically, the CBEMA curve was originally derived to describe the tolerance of mainframe computer business equipment to the magnitude and duration of voltage variations on the power system. Also, the association designed the curve to point out ways in which system reliability could be provided for electronic equipment. Eventually, it became a standard design target for sensitive equipment to be applied on the power system and a common format for reporting power quality variation data. The CBEMA curve was adapted from IEEE Standard 446 (Recommended Practice for Emergency and Standby Power Systems for Industrial and Commercial Applications - Orange Book), which is typically used in the analysis of power quality monitoring results. The CBEMA curve was derived from experimental and historical data taken from mainframe computers. The best scientific interpretation of the curve can be given in terms of a voltage standard applied to the DC bus voltage of a rectifier load. The CBEMA curve is a susceptibility profile with the abscissa (horizontal axis) representing the duration of the event, while the ordinate (vertical axis) indicates the percent of voltage applied to the power circuit. In the center of the plot is the so called acceptable area. Voltage values above the envelope are supposed to cause malfunctions such as insulation failure, overexcitation and overvoltage trip. On the other hand, voltages below the envelope are assumed to cause the load to drop out due to lack of energy. In other words, the concept is that if the supply voltage stays within the acceptable power area then the sensitive equipment will operate well. However, if such an event persist for a longer time, then the sensitive equipment might fail. To elaborate, the CBEMA curve shows that voltage transients of certain magnitudes, say about 200%, are acceptable for short periods of time - 1 millisecond. Yet, that same transient with a duration of 1/2 cycle or 8.333 milliseconds would already cause malfunctions (i.e. disruption of data). Also, the CBEMA curve illustrates that voltage levels below nominal are acceptable, provided that they do not drop below the magnitude and duration indicated by the curve. Thus, a decrease in nominal voltage by 30% for 1/2 cycle would not cause disruption of data. Moreover, the CBEMA curve shows that voltage levels of even zero can be tolerated for a very brief period of time - 4.167 milliseconds or 1/4 cycle. However, losing voltage for only a little more than 1/4 cycle for a computer and/or other extremely sensitive equipment would already cause unwanted disruption. In short, computers, programmable logic controllers (PLCs), power distribution units (PDUs), instrumentation, telecom and other solid-state systems will operate reliably when applied properly. Nonetheless, all these units are voltage and time sensitive, which means that voltage sags and swells, as well as interruptions and transients will critically affect their operation. Furthermore, balanced voltage sag events in three phase systems can be treated effectively as a single phase equivalent. The CBEMA curve is originally utilized to address this case. Yet, most voltage sags are unbalanced, just like the phase-to-ground fault (most common type of fault) in which only one of the phase voltages is depressed. All the highlighted causes of voltage sag events will have to be considered if one is to develop a meaningful power acceptability curve for three phase systems. However, developing a single power acceptability curve to capture all these possible scenarios is nearly impractical. The recommended approach is to model several fault types in conjunction with a dynamic load model to obtain a power acceptability curve. In using the CBEMA curve, one must first determine the nature of the power quality disturbances that are most prevalent in a facility. Power quality phenomena associated with powering, grounding, and protecting solid-state devices can be measured, analyzed, and evaluated using test equipment specifically intended for digital logic systems. These instruments, when located near the suspected disturbance, or when measuring the unusual operation of the power distribution system, will provide data on voltage variations and fluctuations and the specifics on how the power quality problem places the equipment at risk. The measurements and results can then be analyzed in combination with the CBEMA curve to help understand the nature of power quality disturbances. However, in 1994, the Information Technology Industry Council was formed by a working group of the CBEMA. They developed the so called ITIC curve (revised in 2000), which has replaced the CBEMA curve in general usage for single-phase 120 Volt 60 Hz systems. You state "the CBEMA curve shows that voltage levels of even zero can be tolerated for a very brief period of time - 4.167 milliseconds or 1/4 cycle. 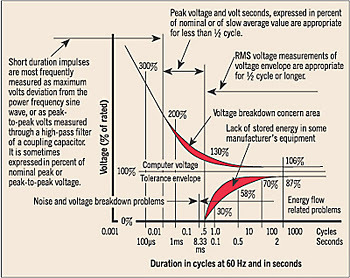 However, losing voltage for only a little more than 1/4 cycle for a computer and/or other extremely sensitive equipment would already cause unwanted disruption", but I don't see anywhere on the curve where it indicates a 1/4 cycle. Instead, it seems to indicate that a complete loss of voltage could be sustained for a 1/2 cycle. What am I looking at incorrectly?